This month I am honored to be in the designer spotlight over at Simon Says Stamp's Wednesday Challenge blog. This week's theme is 'Going Dotty' and the design team are showcasing Basic Grey products. I chose to play with my Basic Grey Picnic stamp set as I just LOVE this cupcake stamp. I paired my cupcake with a sentiment from Simon's 'Square Sayings' stamp set, and added both to a gift card holder, cut with THIS fab die. What a fun, and happy card Lucy!! Love the dotty pocket! SWEET envelope to go with the cupcake! Ooohhh...I love this. You did a FAB job of capturing the wiggle on photo. :) Love the polka dot envie. Awesome gift card! A fabulous card Lucy, I love your colour scheme, your cupcake looks scrumptious and a lovely gift caard!!! So tickled to find you among us, Lucy, welcome!! Love your card, such happy colors! 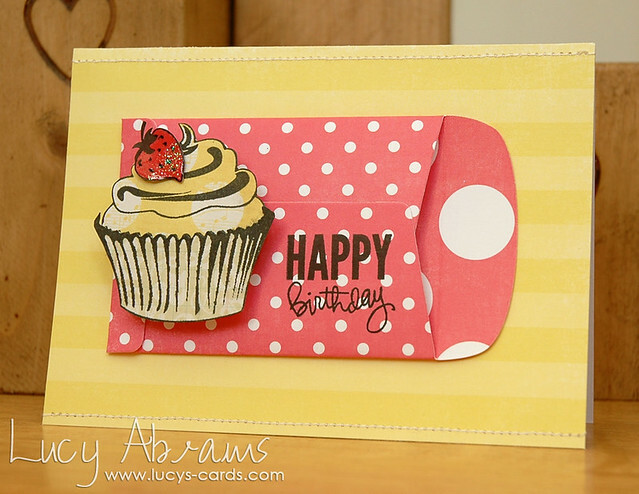 Love the dotty envelope and the yummy cupcake, fab card. Adorable card Lucy! I love that Wiggle Cupcake!! Too cute! 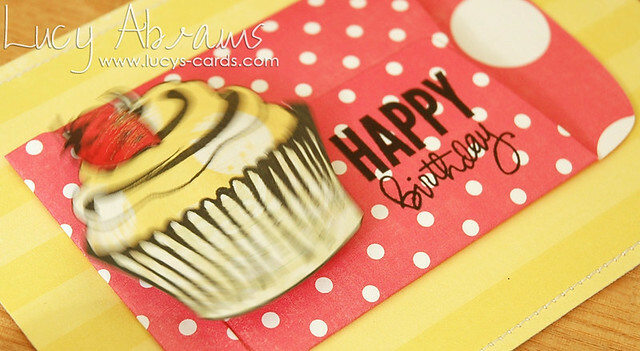 I love the little envelope, which appears to be perfect for a gift card, as well as the clever springing cupcake. Blessings!